Of the Edmonton Duchness Bake Shop! It is different from Deanna’s, so go with your mood (below is pretty much double the recipe, with my added potato, which I use for 1 pie, because we like our meat)…and be sure to serve it up with your favorite chutney! For the filling, heat a bit of oil in a large skillet and saute the pork, onion, celery and potato until the pork is cooked through and no pink is visible – if you bought lean pork, then there shouldn’t really be any excess fat to drain off. Add the remaining 7 ingredients, stir well to combine then bring it all to a simmer for 20 minutes or so until the liquid is almost, but not completely, reduced (juicy, not sloppy). 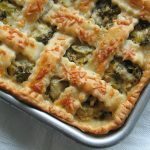 I prefer to time the filling so that it has some time to cool – hot filling on butter pastry doesn’t work out very well! Roll out your pastry as you would and fit it into the pie plate (deep dish, as usual for me) with a bit extra hanging over the edges. 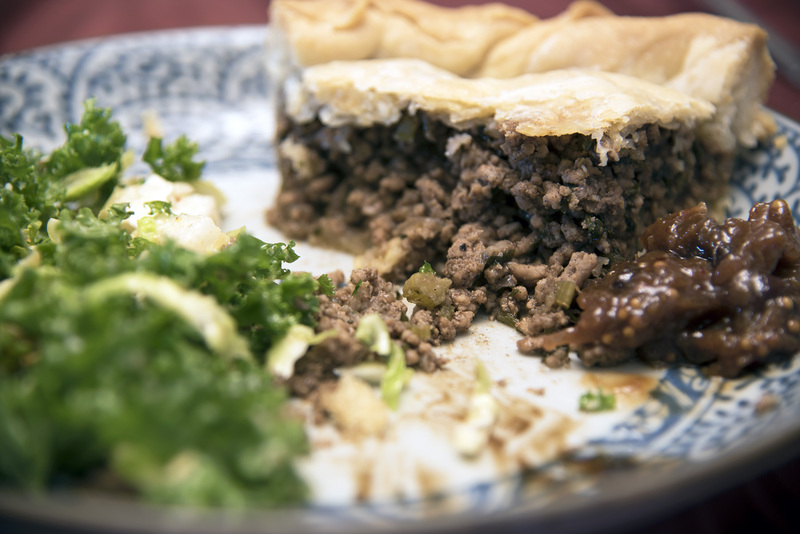 Fill the prepared crust with the cooled meat mixture then cover with the second sheet of pastry, dampen, trim and flute the edges and cut a couple of air vents into the top. Bake at 375 for 1 hour and 15 minutes to 1 hour and 30 minutes – I covered the edges an ‘edge protector’ at the 1 hour mark. The recipe says that you can make this ahead and freeze it (cook it frozen, also at 375), but it will take longer to cook. I think as long as the crust ends up a deep golden brown, it will be perfect – enjoy!